At one time, the Sandy was chock full of large wood. Trees from the surrounding lush, old growth forests would fall in and naturally congregate. They would slow the water around them, aiding in the formation of side channels, opening the floodplain, and providing habitat for Chinook, coho, steelhead and trout. Yet clearcut logging near the river’s edge and the removal of large wood following the flood of 1964 dramatically changed the habitat here. We’re bringing this watershed back to what it used to be. Majestic. Wild. Lush. Dense. Diverse. Powerful. “Fish full.” This is how we’d describe northwestern Oregon’s Sandy River Basin. We know its waters. We’ve spent summer mornings and afternoons knee deep in their cool depths. We’ve studied and monitored them – collected and analyzed data. We’ve protected the native fish that call them home. The Freshwater Trust has been building log jams, placing boulders, replanting native species and reconnecting channels in the basin for nearly a decade. 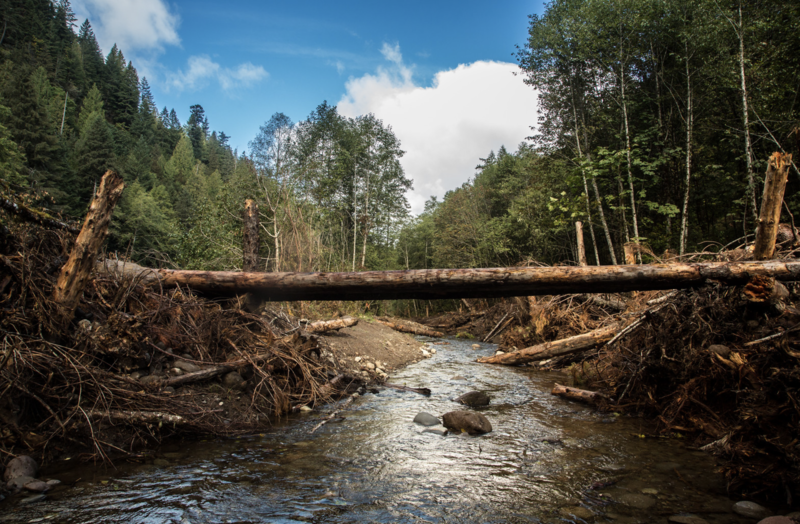 Follow the meanders of tributaries in the basin, and you can see our impact – out of the water in the form of towering, stacked logs, and in it, where coho, Chinook, steelhead and trout swim. McCollister’s excitement comes from the fact that it hasn’t always been like this. 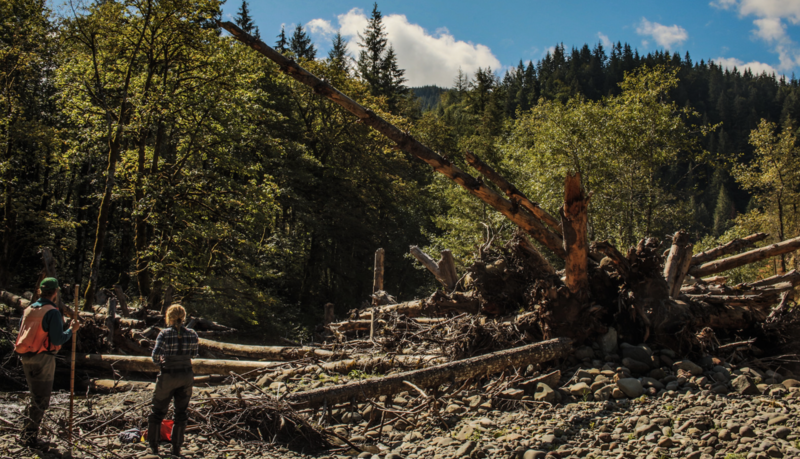 Timber harvests, the removal of large wood to reduce flood risks, increased recreation and development, forest fires, and road construction took a toll on the basin for years. In 1964, the Army Corps of Engineers straightened sections of the Salmon River and removed large wood from the floodplain. A national movement to remove woody debris and meanders was thought to prevent flooding. In actuality, water was carried through the river system faster, exacerbating the problem. These historic actions also decreased habitat diversity and as a consequence, native fish populations – so much so that Sandy River salmon and steelhead were listed under the Endangered Species Act in 1998. A partnership of public and private organizations not only recognized the need for restoration but responded with a grand goal: Identify and implement every known restoration action in the basin. Mark McCollister, Habitat Restoration Director. Over a dozen groups with commitment and expertise, including The Bureau of Land Management, The Sandy River Basin Watershed Council, The Forest Service, Portland General Electric, The Freshwater Trust, the Portland Water Bureau and the Nature Conservancy, became the Sandy River Basin Partners. “We’ve always been driven to reclaim the legacy of the basin,” said McCollister. Together, The Freshwater Trust and the other Partners developed and executed upon one of the first comprehensive and science-driven plans for achieving that. By using fish surveys and modeling, partners evaluated the spawning and rearing patterns of the endangered fish and identified what they refer to as “strategic actions guided by science.” Sites and projects were prioritized based upon what would have the greatest ecological impact. 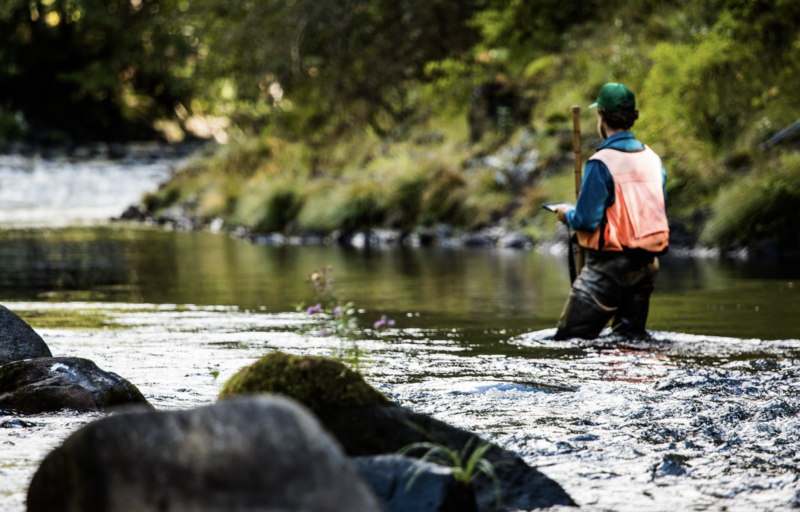 These actions embody the Quantified Conservation method used by The Freshwater Trust. This method is about using data and technology to ensure that every restoration action translates to a positive outcome. Engineered log jam on Oregon’s Still Creek. To date, 196 large wood structures have been installed on the Salmon River and Still Creek. The Partners have primarily focused on three subbasins of the Sandy: Salmon River, Still Creek and the lower mainstem Sandy River corridor. All three watersheds are anchor habitats for salmon and steelhead. The Salmon River begins on the south slope of Mt. Hood and flows for 33 miles before entering the Sandy River. Still Creek is a tributary to the Zigzag River located within the Mt. Hood National Forest near the town of Rhododendron. 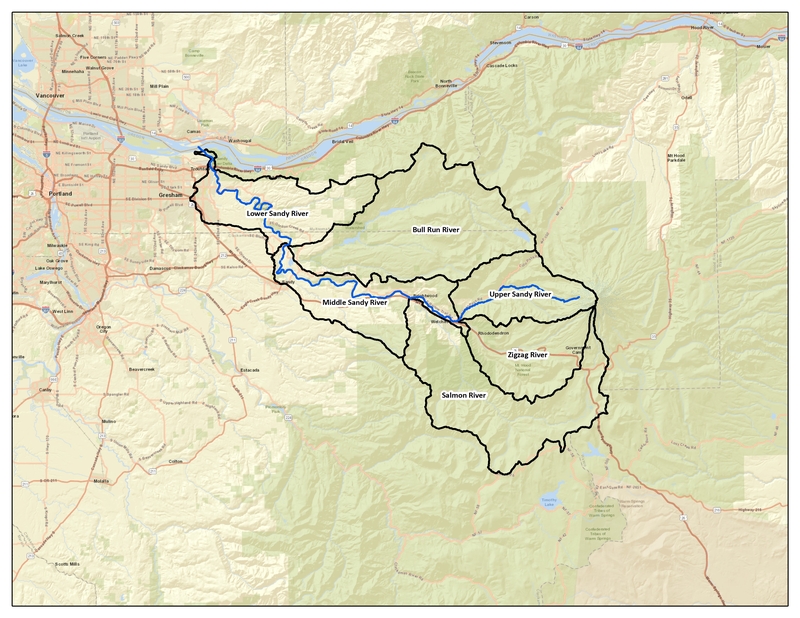 The lower mainstem Sandy is one of the most significant migration corridors for fall Chinook salmon. The Partners use a hierarchical approach to prioritize the type of conservation and restoration projects within these three areas. To date, 26 side channels have been restored on the Salmon River. 196 large wood structures have been installed on both the Salmon River and Still Creek. More than 3,000 pieces of large wood have been placed in the two waterways. Decades ago, large wood was taken out of rivers across the nation to prevent flooding. In actuality, it exacerbated the problem and decreased habitat diversity. 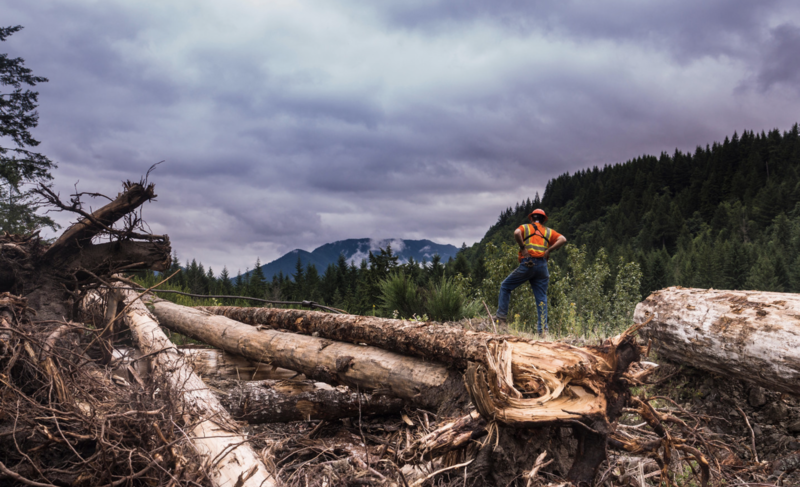 Installing log jams is one of the things we do to fix a river. Here are a few reasons why. For this basin, that assumption has been proven true – in spades. 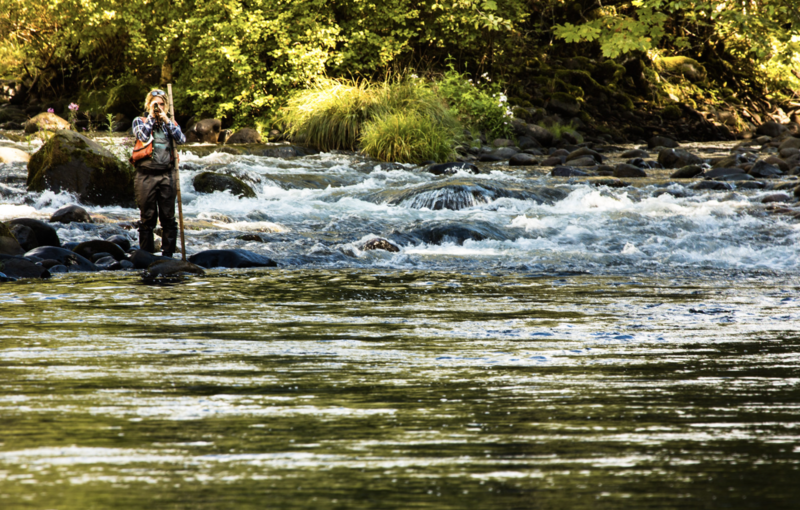 Bruce Zoellick, a fish biologist for the Bureau of Land Management, has been closely monitoring the Salmon River by snorkel for the past several years. Zoellick spotted 64 redds, gravel nests where fish lay their eggs in 2012. In 2014, there were 115, and in 2016, 137 – a number that he calls a world record. The redds are expected to become thousands of adult fish in the coming years. And miles of river and stream will have been restored to welcome them. Additional results from these projects and others can be seen in The Freshwater Trust’s interactive Uplift Tool. 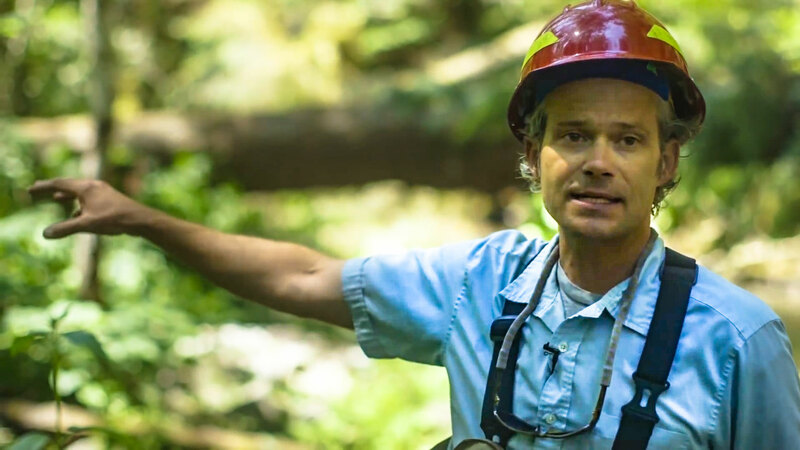 The Forest Service agreed when it awarded the Sandy River Basin Partners the National Rise to the Future Award. This award is given by the USDA Forest Service each year for outstanding restoration accomplishments. 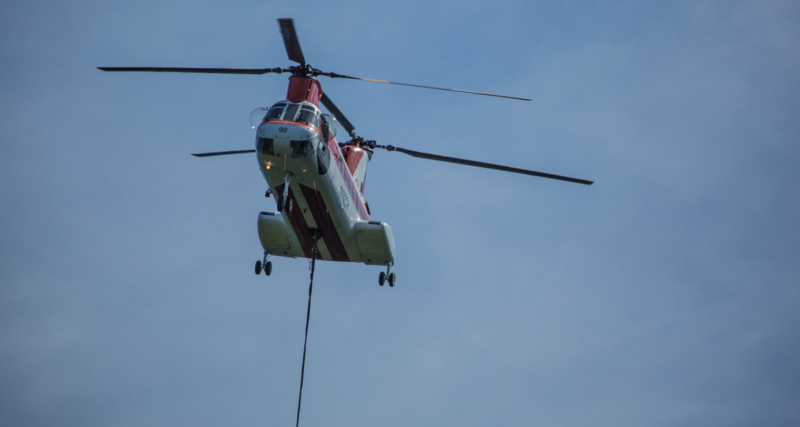 “The Partners have worked collaboratively to implement numerous successful and technically complex restoration projects,” said Lisa Northrop, Forest Supervisor in the Mt. Hood National Forest. The Freshwater Trust, the Sandy River Basin Watershed Council, Oregon Department Fish and Wildlife, Portland Water Bureau, and USDA accepted the award on behalf of the group in May 2016. The Oregon State Lands Board, USDA and American Fisheries Society have also recognized the group’s work. Collaboration has been a force driving impressive results on the ground. But it’s also been behind the scenes. A widespread array of foundations and businesses have financially backed the restoration of river mile after river mile and ensured monitoring will continue on project sites. “We have identified what is broken about our rivers, what fish species and their life stages are affected by the degraded rivers, what needs to be done to fix them, and also importantly, approximately how much it will cost,” said Greg Wanner, supervisory fish biologist with the US Forest Service. Since 2007, the Partners have guided more than $10 million in restoration investment to the basin. Funders have included the City of Portland, Oregon Watershed Enhancement Board, National Fish and Wildlife Foundation, Ecotrust, NOAA Restoration Center, US Forest Service, Bureau of Land Management, Wells Fargo, Patagonia, The Standard, Campbell Global, The Boeing Company, Carol and Velma Saling Foundation, and Pacific Power Blue Sky Habitat Fund. “Funders are attracted to our planning and track record implementing successful projects,” said McCollister. This past summer, Wells Fargo provided $64,000 as part of their Environmental Solutions for Communities grant program. The City of Portland’s Water Bureau recently granted The Freshwater Trust $100,000, an investment in the basin that provides drinking water for the Rose City and more than 900,000 Oregonians. There is more to be done – probably decades of it. We focused our 2017 efforts on seven project sites across the three priority subbasins identified in our plan: the mainstem of the Sandy River, Salmon River and Still Creek. On Still, approximately 500 pieces of large wood were added to 53 large wood structures, opening 11 side channels. On the Salmon River, 146 pieces of wood were added to seven structures. 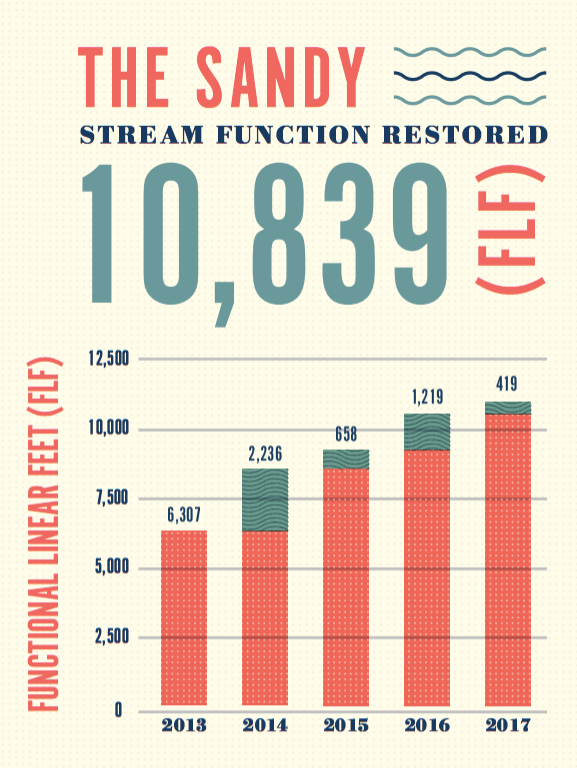 All of this resulted in 419 functional linear feet of stream added to the more than 10,000 already restored. A significant chapter of the partners’ plan, initially started in 2006, was closed in 2018, when all of the restoration work identified for Still Creek was officially completed. 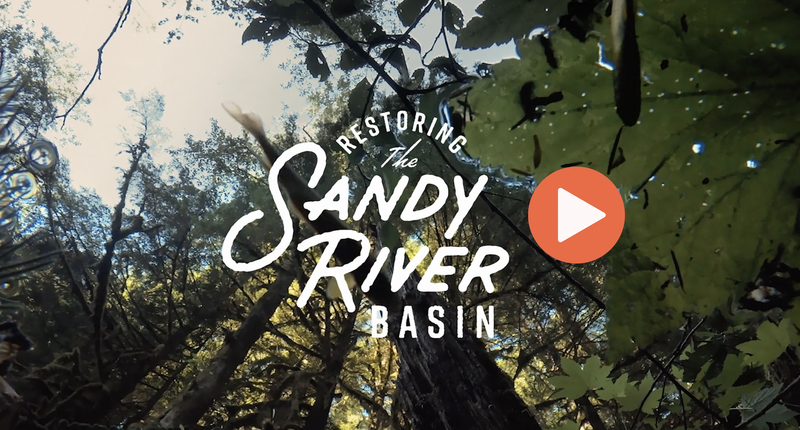 Want to help The Freshwater Trust and the Sandy River Basin Partners keep working on the Sandy? Make a gift today. This is the center of our work. Presenting the 2016 Uplift Report. Over the last 10 years, TFT's projects have directed nearly $4.8 million in restoration investment to the basin. How do large wood structures work? 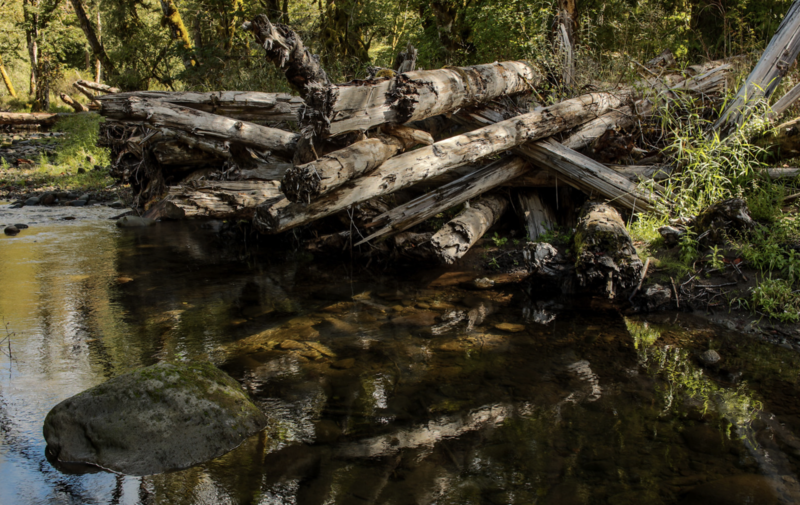 Large wood structures recreate the natural channel complexity historically found in many Oregon rivers. 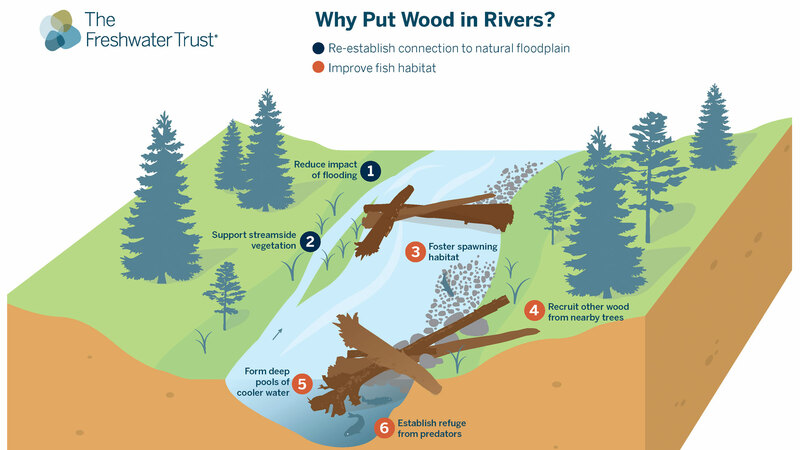 Large woody debris – root wads, limbs and whole trunks – in rivers or side channels helps to control flow hydraulics as well as regulate the transport of sediment, gravels and organic matter through the river system. Logs that span the entire width of the channel raise the elevation of the mainstem water level and divert the water the nearby floodplains. Large wood added to a streambank increases roughness and enhances riparian resilience. Large wood structures also provide desirable habitat for fish. The structures create pools and create a hydraulic shadow where gravel deposits on a streambed, producing ideal conditions for spawning. The pools also provide a refuge from predators or during periods when water levels are low. 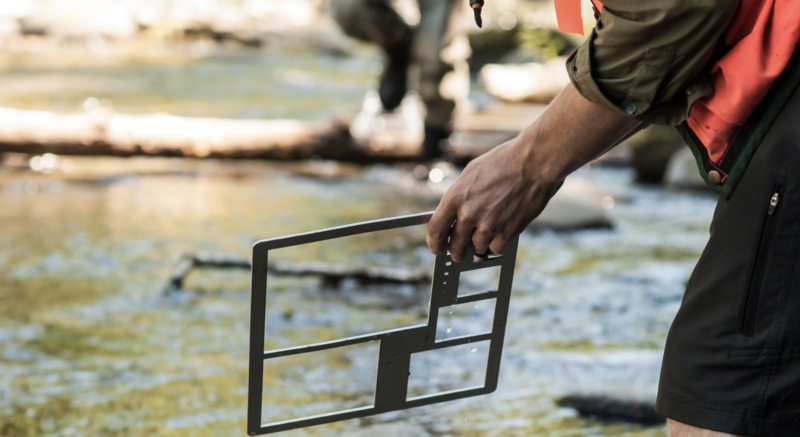 By mitigating flow, the structures can provide safe shelters for fish during high-flow periods. From 2012 to 2015, the Sandy River Basin Partners have treated over 2.5 miles of mainstem river with 1,344 pieces of large wood that in return restored over 90 acres of riparian habitat with 4.1 miles of off-channel habitat including side channels, alcoves, and beaver ponds. How are large wood structures built? To construct new large wood structures in a straightened channel, trees can be felled on site or flown to the project areas. Trees are often obtained and reused from other areas. We get them from road and development projects, those that have blown down or timber sales. Each structure that is installed can contain between 15 and 40 pieces of wood. The wood structures can be anchored to existing trees, the streambank or streambed. Why are invasive species bad for habitat? Invasive species often crowd out native species and change the characteristics of habitat for native wildlife. In certain circumstances, they can also be thirstier than native plants. Why is restoring side channels important? At the most fundamental level, restoring and reopening side channels means fish have more spawning and juvenile rearing habitat. Side channels provide low velocity areas where juvenile fish can rear year round and also provide refuge during higher winter flows. What monitoring is undertaken in the restored habitat areas? Physical pre- and post-restoration monitoring has included cross-section and longitudinal (lengthwise) profile measurements of the stream channel, streambed pebble counts, stream habitat surveys, and photo point documentation completed cooperatively by the Bureau of Land Management, The Freshwater Trust, Sandy River Basin Watershed Council and the Forest Service. Pre- and post-restoration biological monitoring has included over 20 years of continuous smolt (young salmon or trout) out-migration monitoring and spawning surveys completed cooperatively by the Bureau of Land Management, the Forest Service, Oregon Department of Fish and Wildlife, and Portland Water Bureau. On-going post-project effectiveness monitoring occurs following construction to establish as-built conditions. Physical habitat surveys are repeated following construction and after events such as flooding. What is the resulting fish response in the restored habitat? In Salmon River project areas, fish response was immediate and was assessed via spring Chinook, coho and winter steelhead spawning surveys and juvenile fish surveys and visual observations made by project partners. 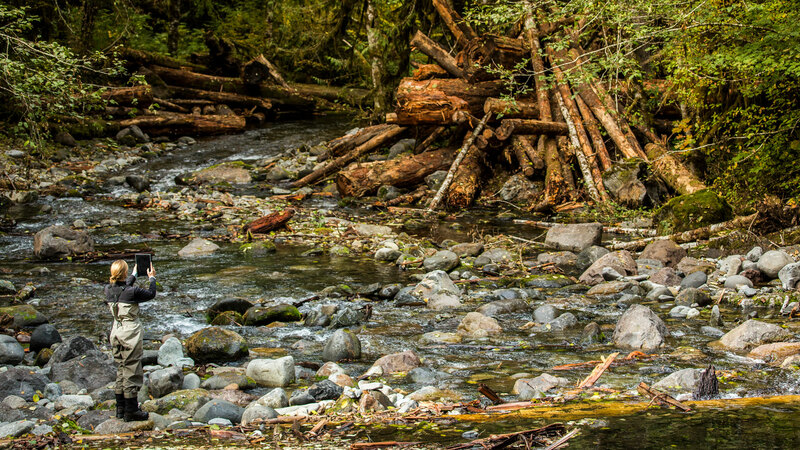 Additional snorkeling surveys have confirmed the use of large wood structures in side channels and in the mainstem river by adult and juvenile salmon and steelhead. Winter steelhead, coho and spring Chinook salmon have been observed spawning and rearing in restored side channels. 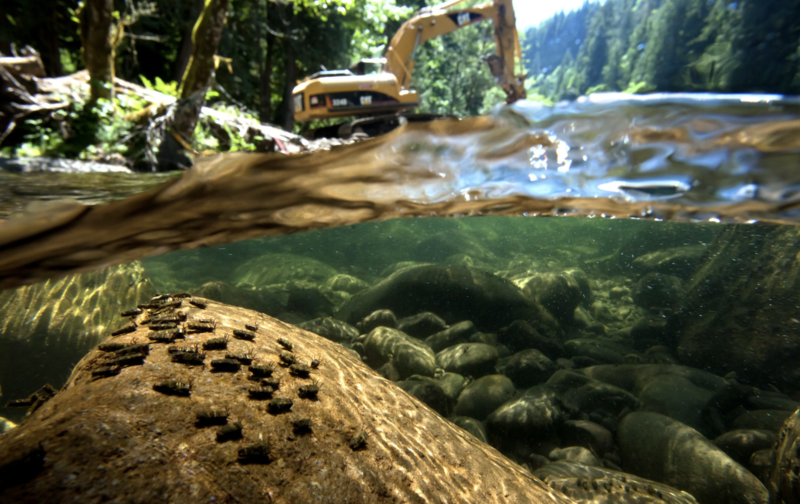 In year-over-year monitoring, from 2012 to 2015, the Bureau of Land Management-Salem District found significantly more winter steelhead and Chinook salmon spawned in gravel patches associated with the Salmon River large wood projects. During 2009 to 2015, an average of 10 coho salmon redds per mile were located in reconnected side channels within the restored reach. The number of coho redds in reconnected side channels tracked yearly coho abundance in the Sandy River Basin, based on Oregon Department of Fish and Wildlife estimates of coho population. The number of redds in side channels (19 per mile) was greatest in 2014, with 9 redds per mile in restored side channels in 2015. How does the Sandy River Basin conservation plan set out the prioritized restoration strategy for the watershed? The Sandy River Basin Partners formed a coalition in response to the federal listing of threatened species for Chinook, steelhead and coho. The Partner’s vision is to restore the rivers and streams of the basin for fish and for people though a coordinated basin-wide strategy built from a solid scientific foundation. From 2001 to 2006, the Partners worked collaboratively to develop a fish habitat database and model to help assess conditions for Chinook, steelhead and coho within the Sandy River Basin. Water temperature data was added to the dataset. These assessments identified approximately 150 restoration opportunities targeted to address limiting factors for the fish, all of which were then compared to a set of anchor habitats for four fish species. Finally, the Partners completed a habitat and conservation restoration strategy that zeroes in on the priority locations in the watershed and the priority restoration actions needed to achieve results. This strategy ensures the appropriate types of restoration actions are identified and implemented in priority sequence to address the primary changes and alterations in watershed processes responsible for the factors limiting salmon and steelhead production. Restoration actions identified for treating the root causes of impaired habitat conditions are considered higher priority in order to ensure the achievement of greatest long-term restoration benefits. This is in contrast to implementing short-term actions that treat only the symptoms of aquatic habitat impairment. The main priority actions and their outcomes include: reconnecting isolated habitats such as redesigning bridges for improved fish passage and reconnecting side channels; restoring natural watershed processes such as decommissioning forest roads and replanting native vegetation; and restoring natural instream processes such as reintroducing large woody debris. What organizations make up the Sandy River Basin Partners? The 12 collaborative partners include: Association of Northwest Steelheaders, Bureau of Land Management, City of Portland Water Bureau, Clackamas County Department of Transportation and Development, East Multnomah County Soil and Water Conservation District, National Marine Fisheries Service, Oregon Department of Fish and Wildlife, The Freshwater Trust (formerly Oregon Trout), Sandy River Basin Watershed Council, The Nature Conservancy, U.S. Fish and Wildlife Service, and U.S. Forest Service.